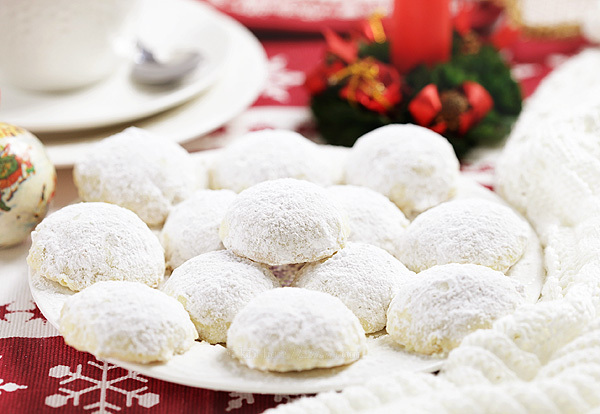 Russian Tea Cakes – melt-in-your-mouth snowball cookies to sweeten every holiday celebration. 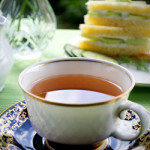 The history of Russian Tea Cakes is somewhat mysterious. 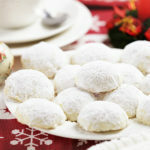 They are also known as “Mexican Wedding Cakes”, “Italian Wedding Cookies“, “Snowball Cookies” or “Butter Balls”. 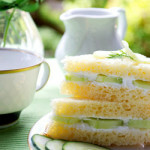 It seems they first appeared in Eastern Europe, but it is known that they were served in 18th century Russia during tea ceremonies. European nuns brought the recipe with them to Mexico where they worked as missionaries. 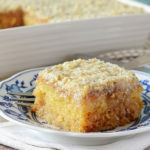 Mexicans added a pinch of cinnamon or anise to the recipe and started serving them at wedding parties. This recipe reminds me of my mothers’ Vanilla Crescent Cookie recipe, which has been in our family for a long time. 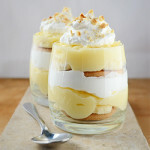 Ingredients are pretty similar, the only difference being that there is an egg in the mixture. Christmas in our house was inconceivable without those cookies. I started with a Betty Crocker’s recipe for Russian Tea Cakes. I wanted to make them even more delicate and melt-in-your mouth, so I used less flour. I also doubled the amount of vanilla and lowered the amount of salt. Instead of walnuts I used ground hazelnuts (filbert nuts) since I like their flavor better and they are not bitter like walnuts. Although you can make walnuts less bitter by toasting them slightly. 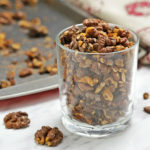 Almonds or pecans can also be used instead of walnuts/hazelnuts. Most recipes for Russian Tea Cakes call for chopped nuts. 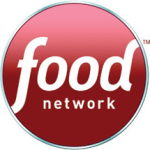 I prefer ground nuts, so I put my (toasted and peeled) hazelnuts in a food processor and processed until about 2/3 hazelnuts were finely ground, while the rest were still chopped. 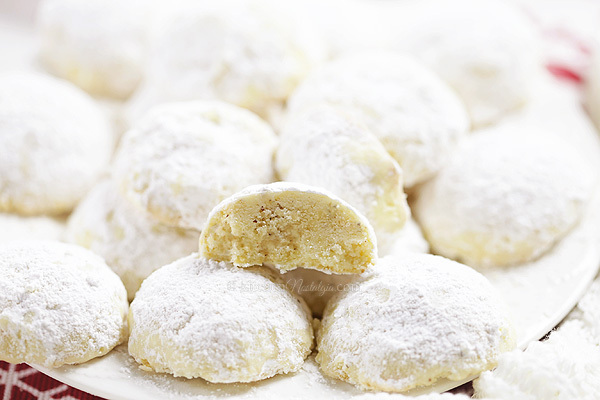 You will have to roll cookies in powdered sugar twice, if you want them to look pretty, because after first rolling, when cookies are still warm, the sugar will melt into the surface of cookies. After that, you need to let cookies cool completely and then roll them in powdered sugar once again. 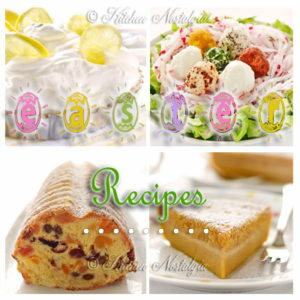 Melt-in-your-mouth Russian Tea Cakes will certainly sweeten your every holiday celebration party! 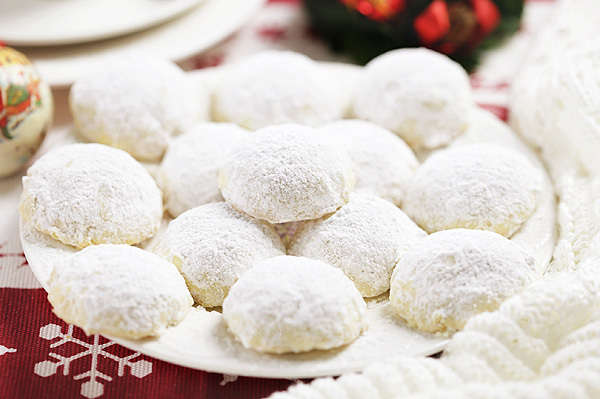 Russian Tea Cakes - melt-in-your-mouth snowball cookies to sweeten every holiday celebration. Combine butter, powdered sugar and vanilla. 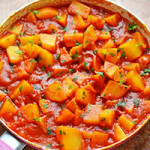 You can do it either by hand or using food processor. Add flour and salt. Mix until blended. Add ground hazelnuts and keep mixing until you get large lumps of dough. Take 1 tablespoon of dough and form a ball. 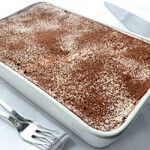 Place on a baking tray covered with baking paper. Repeat until you use all of the dough. Bake in 400 F (204 C) preheated oven for about 7 min in a fan oven (regular ovens may need a few minutes more). Cookies should not turn brown. Take cookies out of the oven and let them cool enough that they can be handled without breaking, but are still warm to the touch (about 5 minutes). 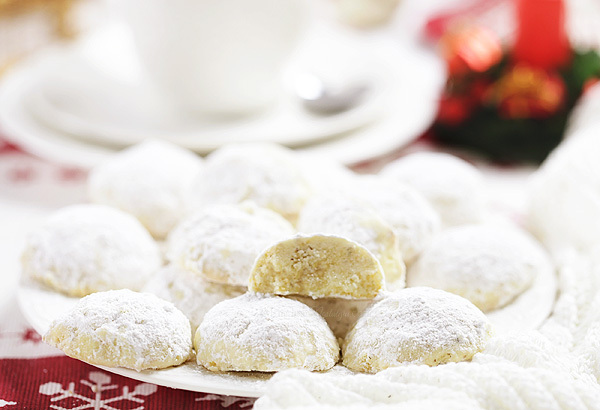 Roll cookies in powdered sugar. Let cool completely. 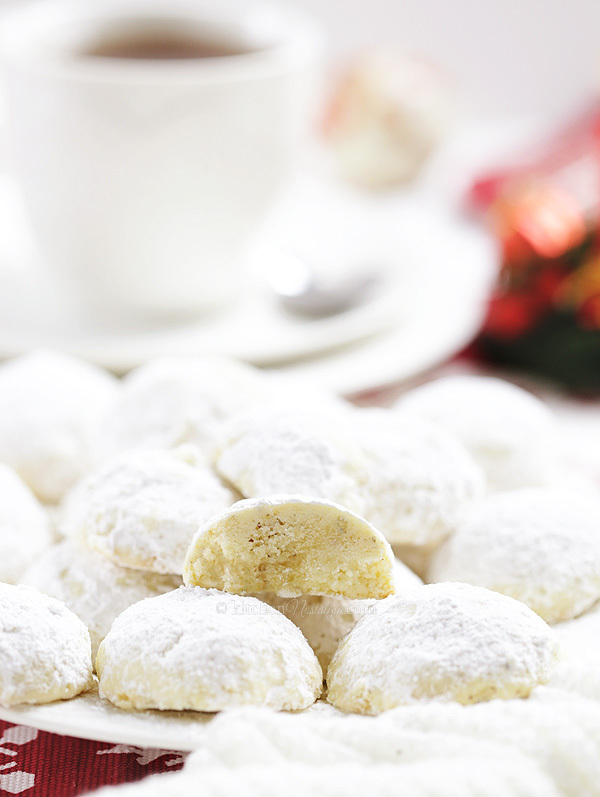 When cookies are cooled, roll them in powdered sugar one more time. Store in a closed container with a paper towel between rows of cookies. Ohh!! I’ve eaten this delicious and totally addictive cookies as “Mexican Wedding Cookies” but, what ever you call them, you CAN’T EAT JUST ONE!!!!! 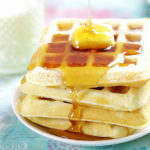 Thank you for this revised recipe, I like the tip on using less salt and more Vanilla, I bet that using less flour makes them even more buttery. Merry Christmas and a wonderful, healthy and joyful 2008! !